As soon as you sign in, we'll show you the latest exchange rates for each of our travel currencies. Tip! Click the "sort" tab to change the order of this list to suit your personal preferences. You'll need to do this on each device you use. 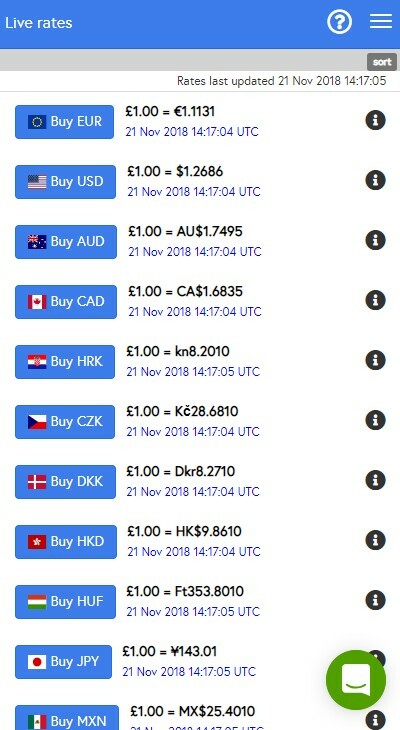 Select a currency and then click the "forward order" tab. 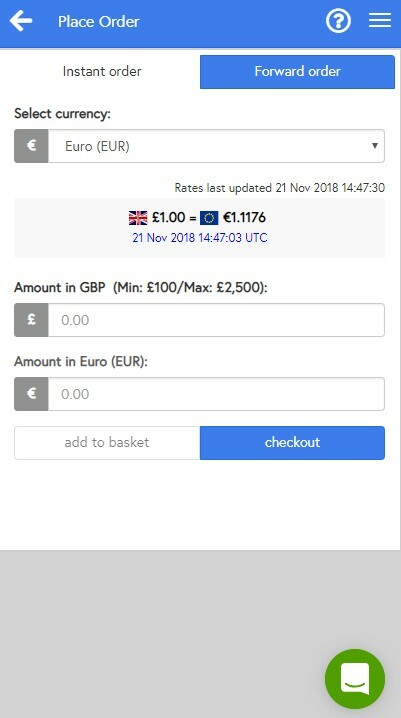 Set the target exchange rate for your chosen currency. If you are not sure what's a realistic target, take a look at the rate tracker. 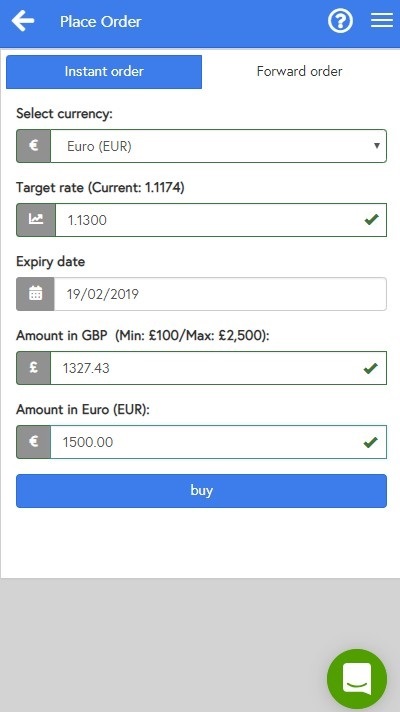 You can set your forward order to expire up to 90 days in the future, and specify your requirement in GBP to spend or foreign currency to buy. Tip! The target must be greater than the current exchange rate. Don't worry if you've selected more than 90 days in the future as we'll correct that for you. Tip! Forward Orders have the same spending rules as Instant Orders. So you can't start a new one the same day as the last order; you can only spend up to £2,500 in each order; and you can only spend £10,000 annually. We'll automatically round your foreign currency to the smallest note we supply, and quote the GBP cost based on your target exchange rate. 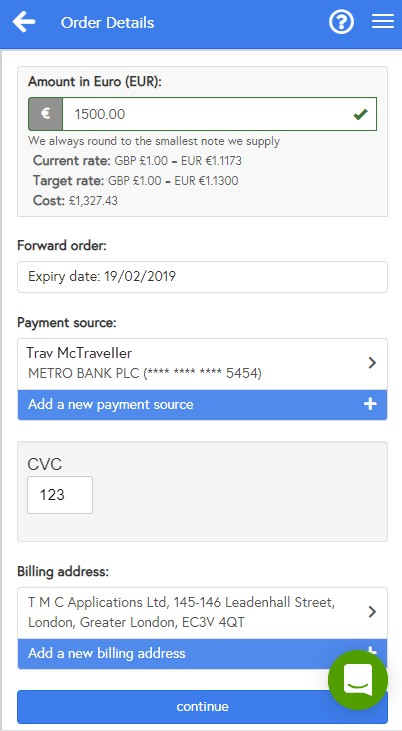 If you have ordered previously, your default payment source will be automatically selected ready for you to enter your CVC security code for authentication. Tip! If you want to use an alternative card that you have used previously, please tap the existing card to access the complete list of previously saved cards. If you want to use a new card you can tap to add a new payment source. If this is your first order or you have deleted all previous payment sources, you will be automatically prompted to enter new card details. Remember, you are submitting your card details directly to Worldpay for authorisation and we never see them. Forward Orders are always delivered next business day (if executed before the daily order cut-off on any business day) by Royal Mail Special Delivery Guaranteed by 1pm. If there is a problem with delivery, it is important that you provide a contact telephone number for the chosen delivery address. 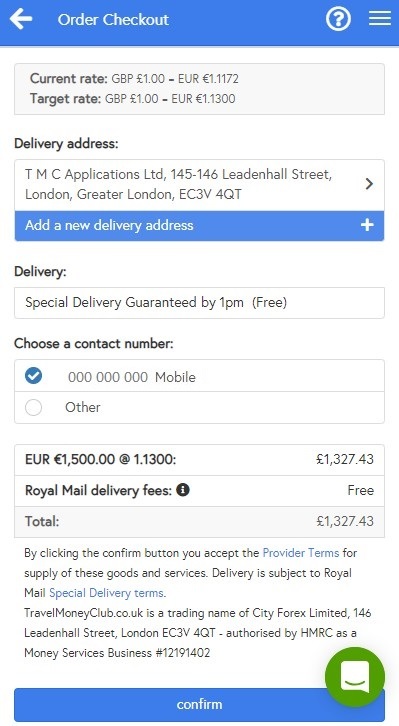 You can chose your default mobile or home number, or provide a number for relative or work colleague who will be available at the delivery address. Check the details before confirming your order and submitting payment for pre-authorisation (we won't take any funds unless or until the order executes). You will still be able to cancel the Forward Order until such time as it executes or lapses. 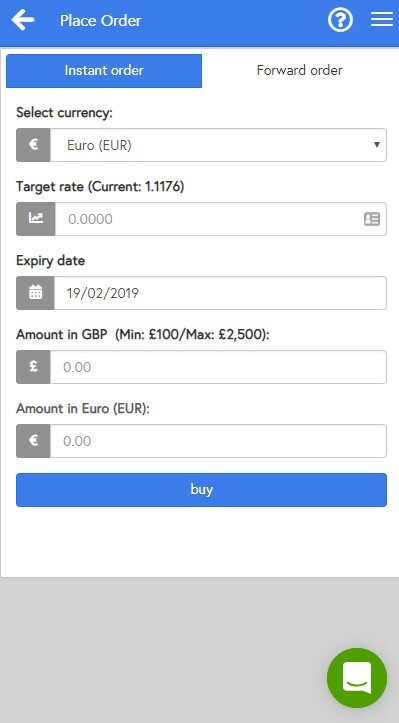 We will monitor your currency until the expiry date on your forward order, and automatically execute the order if the target exchange rate is reached. It is only at this point that it becomes an accepted order, and can no longer be cancelled or withdrawn. While pending you can cancel the order at any time. This would be required if, for example, you decide to place an Instant Order. 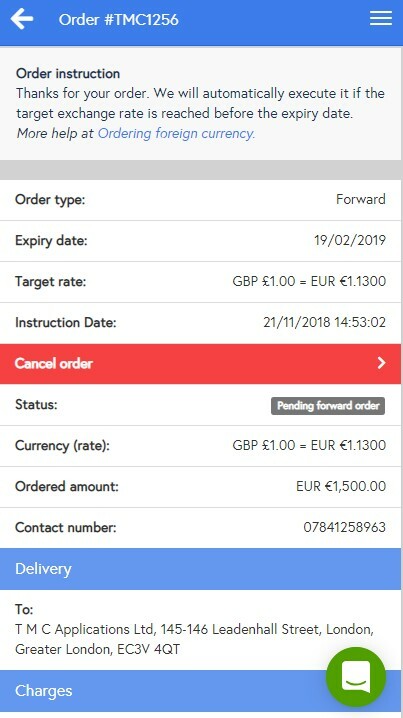 Instant Orders cannot be placed while a Forward Order is pending. We'll update your order with the delivery date, if and when the order executes. 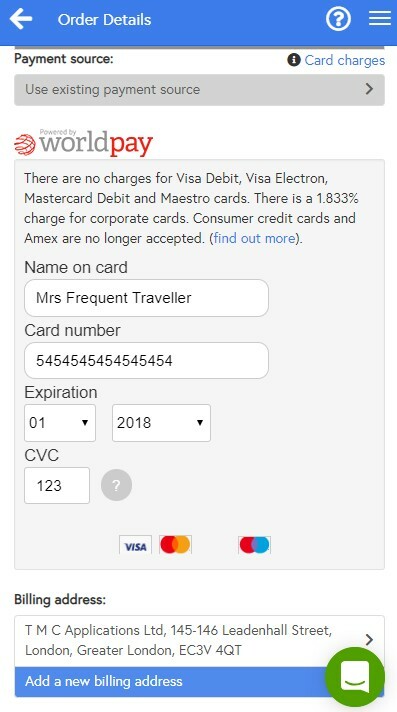 Remember to ensure you have sufficient funds on your card until the Forward Order expiry date, as we'll automatically cancel the order if it executes and your card is declined. We'll keep you informed of progress by email, so you'll know what's happening with your order at all times. If you have a delivery enquiry, please call the telephone number shown on-screen or provided in your confirmation email. You can also start a conversation via the support badge bottom-right when signed in to the app or website.